Ignitions of the Mariposa Grove prescribed fire continued this past weekend with an additional 36 acres completed in the upper grove. The project consists of 137 total acres, of which 75 acres have been completed over the last couple weeks. Fire personnel will continue to monitor and patrol the grove area. The Grove is currently closed to the public because of a major restoration project; burning at this time minimizes impacts to public use. Smoke will be present during this project. Smoke, affecting health, is always a consideration in the decision to schedule prescribed fires. Community members and visitors who are sensitive to smoke may way to close their windows and doors and/or consider leaving the area during ignition of the project in order to reduce exposure. The objective of this prescribed fire is ecosystem restoration. Historically, natural fire burned an average of 16,000 acres annually in Yosemite National Park and played an integral role in shaping Yosemite’s ecosystem. Yosemite’s Fire Management Program works to balance the protection of life, property and natural and cultural resources with the continuation of fire as a natural process. Applying fire under prescribed conditions mimics the frequent, low intensity, lightning caused fires. Burning in the Mariposa Grove is a continuous process; the targeted areas have had 1-3 prescribed fires in the past 30 years, and continued burning is required to maintain healthy forest conditions. Fire produces the optimum conditions for Giant Sequoia reproduction and propagation. Fire not only removes the accumulated layers of dead woody debris, exposing nutrient rich mineral soil, but dries the cones allowing the seeds to shed. Fire also creates holes in the forest canopy, while eliminating shade tolerate competition. The Lakes Fire in the Chilnualna Lakes area, between Turner Meadow and Buena Vista Peak, is a lightning caused fire that is being managed for multiple objectives. A ground reconnaissance was completed by Yosemite Crew-1 members earlier this week and reported the fire to be 1,001 acres. The fire had previously spread to the area of the 1999 Chil Fire area and has been most active on the west, north and northeast edge of the perimeter. Smoke has been visible from various locations within the park and surrounding area. 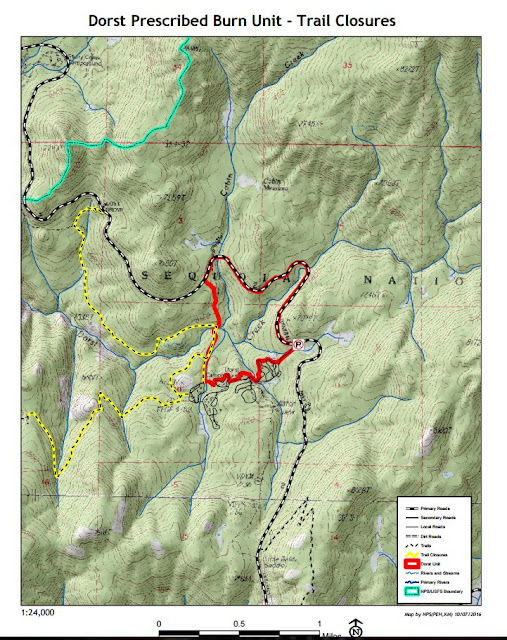 A trail closure is effective as of August 25, 2016, as the fire crossed the trail along Chilnualna Creek. 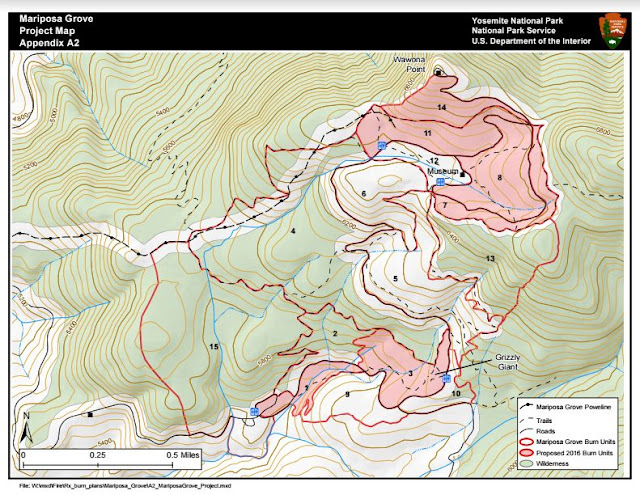 The trail section between Turner Meadow (beyond the top of Chilnualna Fall) and Buena Vista Lake is included in the closure. When and Where: Yosemite National Park fire managers are planning to continue ignitions of the Mariposa Grove prescribed fire project on Saturday October 22, 2016 and Sunday October 23, 2016. The focus will be in the upper grove for a total of 55 acres. An estimated 7 to 10 days of active burn down is anticipated. Fire managers have already successfully completed 75 acres of ignitions, out of the 137 acre total project. Smoke will be present during the prescribed fire and in the Wawona area. 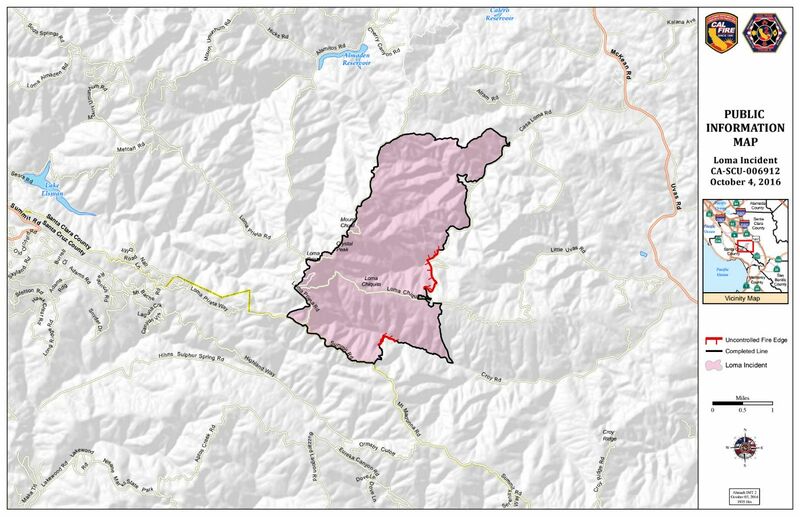 Fire managers are working with the Mariposa County Air Pollution Control District (MCAPCD) to time the project to coincide with favorable weather and smoke dispersion conditions. Smoke, affecting health, is always a consideration in the decision to schedule prescribed fires. A smoke management plan has been submitted to the MCAPCD, and a burn permit has been issued. A smoke monitor will be placed in nearby communities. Historically, natural fire burned an average of 16,000 acres annually in Yosemite National Park and played an integral role in shaping Yosemite’s ecosystem. Yosemite’s Fire Management Program works to balance the protection of life, property, and natural and cultural resources with the restoration of fire as a natural process. Due to decades of fire suppression (actively putting out any fire that started), many areas have become overgrown, unhealthy, and increasingly vulnerable to catastrophic wildfire. The Mariposa Grove project is near the top of the Grove from Wawona Point to the south. Fire managers want to take advantage of the Mariposa Grove closure to conduct the project. The Grove is closed to the public because of a major restoration project. Burning at this time will minimize impacts to public use. Burning in the Mariposa Grove is a continuous process; the targeted areas have had 1-3 prescribed fires in the past 30 years, and continued burning is required to maintain healthy forest conditions. Fire produces the optimum conditions for Giant Sequoia reproduction and propagation. Fire not only removes the accumulated layers of dead woody debris exposing nutrient rich mineral soil, but dries the cones allowing the seeds to shed. In addition, fire creates holes in the forest canopy, while eliminating shade tolerate competition. Park employees, community members, and visitors can expect to see fire personnel from various federal and state agencies conducting burning operations during the Mariposa Grove prescribed fire. Ignitions of the Mariposa Grove prescribed fire continued this week with an additional 44 acres completed in the upper grove. Last week, 31 acres were completed in the lower grove. Fire personnel will continue to monitor and patrol the grove area. The Grove is currently closed to the public because of a major restoration project; burning at this time minimizes impacts to public use. SEQUOIA NATIONAL PARK, Calif. October 7, 2016 – Following a conditions assessment by park fire ecologists and firefighters, dates have been confirmed for the Dorst Prescribed Burn in Sequoia National Park. Ignitions on the prescribed burn will begin on Monday, October 10, and continue for 2 to 3 days. Weather forecasts and recent fuel moisture samples show that this timetable will provide the best opportunity for a successful burn with minimized smoke impacts. The burn unit is located adjacent to Dorst Campground, which is currently closed for the remainder of the year, and south and west of the Generals Highway. Smoke is likely to be present on the Generals Highway, and may cause delays or short-term closures if visibility becomes impaired. Visitors should expect to see firefighters, smoke, and fire activity in this area and are asked to drive carefully. Depending on dispersion, the town of Three Rivers may experience smoke impacts at night during ignitions. The trail between Lost Grove and Dorst Campground and the Muir Grove Trail will be closed during ignitions and the burn-down period afterwards. The reopening of these trails will be contingent on evaluation by fire management personnel and will be announced in subsequent news releases. Trail closures will be in effect during the prescribed burn. Please see the Trail Closure Map under Maps. FELTON – The Department of Forestry and Fire Protection (CAL FIRE) San Mateo – Santa Cruz Unit, in cooperation with Peninsula Open Space Trust, Sempervirens Fund, and Save the Redwoods League will conduct a 5-acre prescribed burn on the San Vicente Redwoods property in northern Santa Cruz County on October 10, 2016. The prescribed burn will be conducted between the hours of 10:00 am and 4:00 pm, but smoke may be noticed in the area for about one day following the burn. The project is being conducted in accordance with a Smoke Management Permit issued by the Monterey Bay Unified Air Pollution Control District in order to minimize the smoke impacts on surrounding communities. Resources involved with conducting the burn include 5 engines and 2 fire crews. Approximately 50 personnel will be assigned to this operation. This burn is being conducted as part of the CAL FIRE Vegetation Management Program and is intended to reduce fuel accumulations in a portion of the shaded fuel break completed by the Bonny Doon Fire Safe Council three years ago, and to provide ecological benefits such as nutrient cycling and recruitment of fire-dependent plant species. Prescribed vegetation management burns are carefully planned controlled burns that must meet a predefined set of conditions (prescription) in order to achieve ideal fire behavior. No burning takes place if weather and fuel conditions are not within prescription. When optimal conditions are met, trained wildland firefighters manage the burn while monitoring the weather, smoke dispersal, fire behavior and designated fire control lines. The effects of the prescribed burn at San Vicente Redwoods will be a subject of ongoing research, with funding support from POST, Sempervirens Fund, and Save the Redwoods League. The three groups are currently funding research by the Amah Mutsun Land Trust to evaluate prescribed burning as a tool for vegetation management, enhancement of ethnobotanical resources, and fire safety. Gilroy, CA - Fire crews will remain throughout the fire perimeter in the coming weeks to provide fire suppression repair, remove firefighting equipment, mop up and patrol. Please drive slowly and use caution as emergency crews and equipment are still working in the area. CAL FIRE urges those that see significant smoke to call 9-1-1. As fires continue to threaten our communities, resources are being effectively appropriated to battle wildland fires across the State of California. All residents are asked to be READY: Create and maintain defensible space and harden your home against flying embers. Get SET: Prepare your family and home ahead of time for the possibility of having to evacuate. Be Ready to GO! Take the evacuation steps necessary to give your family and home the best chance of surviving a wildfire. We encourage the public to remain prepared year-round for wildfires by visiting the www.readyforwildfire.org website. The best show of support is having your home and property “fire-ready”.